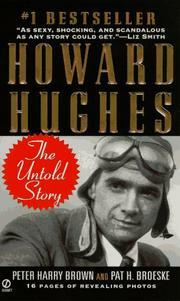 1 edition of Howard Hughes found in the catalog. Are you sure you want to remove Howard Hughes from your list? Published May 1, 1997 by Signet . IT WAS THE MOST DIFFICULT BIRTH DR. OSCAR L. NORSWORTHY HAD EVER witnessed.